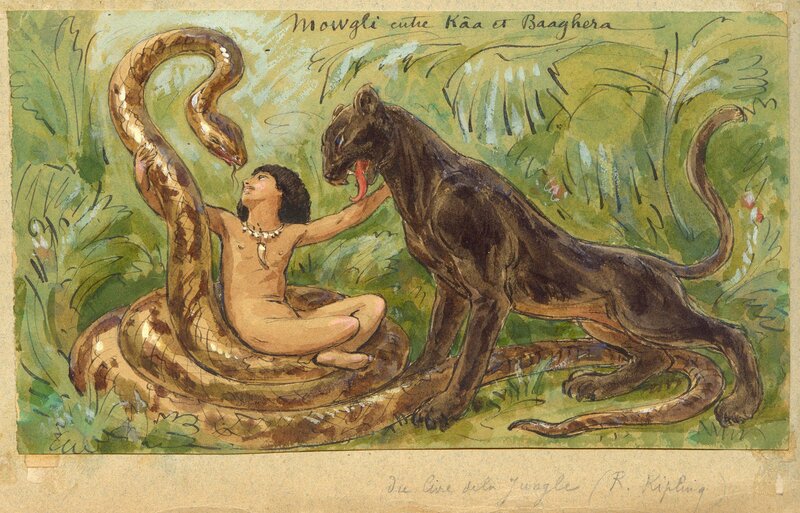 Here’s a little something I acquired on eBay It’s a small French watercolour of Mowgli with Kaa and Bagheera. It might have been intended as an illustration for an edition of Le Livre de la Jungle. There’s no date or artist’s name, but from the amount of fading on the backing paper I’m guessing early to mid 20th Century. The person who sold the picture was under the impression that Kaa was threatening Mowgli and that Bagheera was trying to rescue him, but that assessment was based on the characterisations in the Disney versions. Anyone who’s familiar with the original Mowgli stories will realise that Kaa is actually a loyal friend and protector, and the picture simply depicts three friends enjoying a moment.